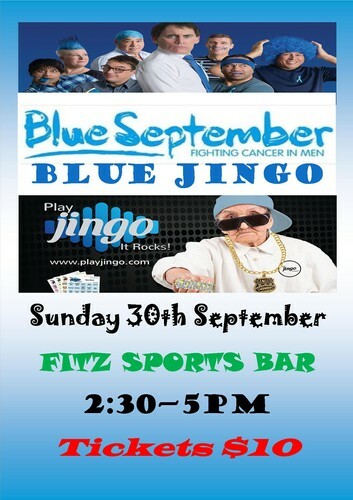 We are having Blue Jingo (Music Bingo) supporting Blue September New Zealand & Prostate Cancer Foundation of New Zealand. Tickets available on the day. If you wish to reserve a table! - You can do so by ringing 03-963-1766. Come along for a fun afternoon to raise money & awareness for this cause! Come dressed in Blue! Prizes for best dressed!